I will confess that until now I was unfamiliar with kugel. 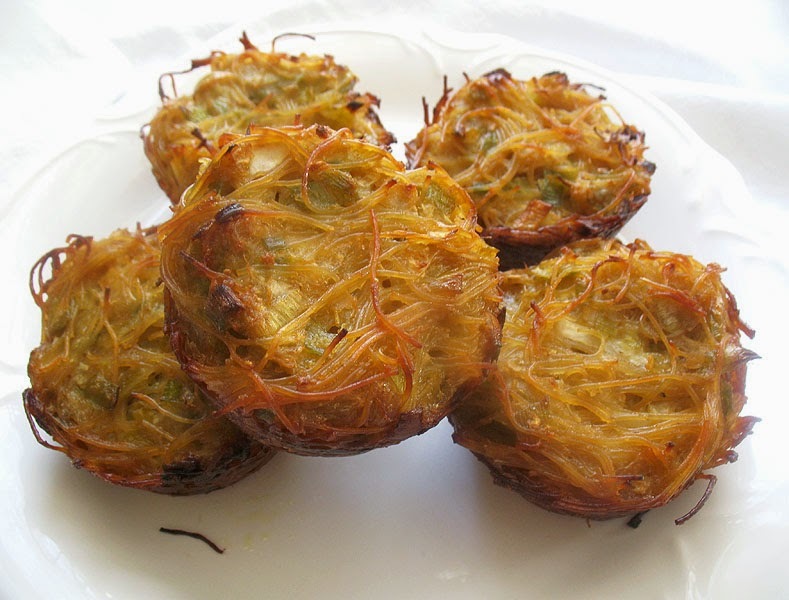 It is a baked Jewish dish, somewhat like a casserole or pudding, made with noodles and eggs and sometimes potatoes. There are endless variations with different vegetables, seasonings and sweeteners — sometimes nuts or dried fruit and cinnamon are included. Depending on how sweet they are, they can be served as a side, for dessert or for breakfast or brunch. 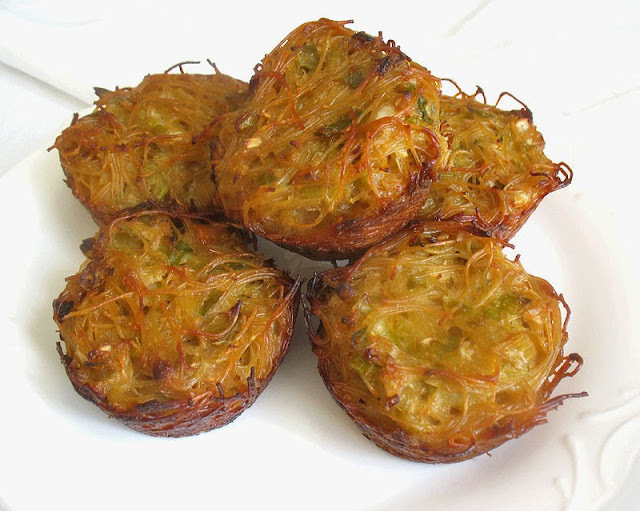 These savory and slightly sweet cabbage and leek snack-size kugels make for an excellent breakfast. 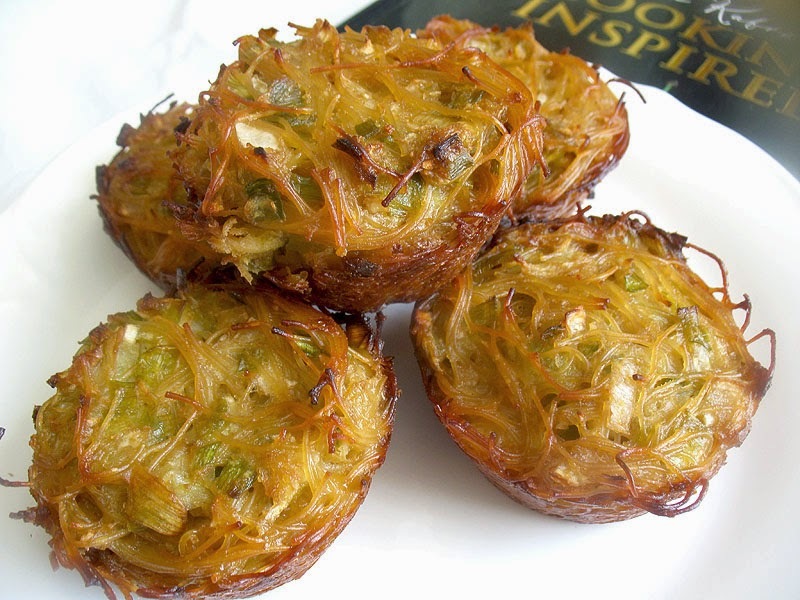 The recipe is adapted from Cooking Inspired by Estee Kafra. I received a copy for possible review and this is one of the first recipes I tried because it was new to me. I don't often eat eggs, but I was intrigued. My husband does happen to enjoy eggs, so these were a perfect breakfast for him. I must say, I enjoyed them too. Crispy on the outside and soft and creamy inside, they really are rather easy to make and certainly an economical dish. They are also very portable, making them an ideal choice for gatherings. Heat 4 tablespoons of the oil in a large saucepan over low heat. When hot, add the cabbage and leeks and cook, stirring often, for 20 minutes. Stir in 1 teaspoon of the sugar and continue to cook, stirring occasionally, for 20 to 25 minutes or until the vegetables are tender. Remove from heat. Preheat an oven to 450° and grease 24 muffin cups. Bring a large pot of salted water to a boil. Stir in the egg noodles and cook for 5 minutes. Strain and rinse with cold water. Transfer to a bowl and toss with 1 tablespoon of the olive oil. In a large bowl, lightly beat the eggs. Add the remaining 1/2 cup of sugar, 2/3 cup of olive oil, breadcrumbs, salt and pepper, and stir until well combined. Now stir in the noodles and vegetables and mix well. Spoon the mixture evenly into the cups. Bake in the preheated oven for 15 minutes and then reduce the heat to 350°. Bake for another 30 minutes. 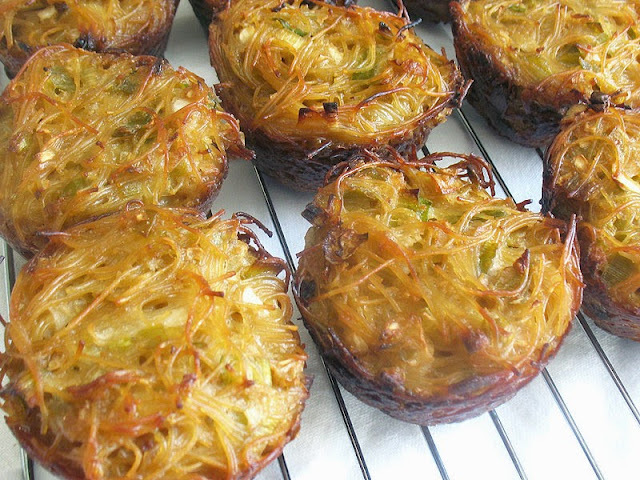 Remove from the oven, gently run a sharp knife along the edges of the kugel, and let stand for a few minutes before transfering to a wire rack to cool. Note: You may make these in 9" round baking pans, but I was attracted to the idea of making them in muffin tins for little bites. I found I had enough of the mixture to get 24 of them, but adjust accordingly. I baked them in two batches so I could position the pan in the center of the oven without crowding. If you choose to use round baking pans, cook them the same as the ones made in the muffin tins, but increase the baking time by 15 minutes. I am loving these Lisa, they look amazing and nice photos! Thanks for entering them into Bookmarked Recipes. The roundup is now live. I've heard of kugel, but I've never actually tasted it. Really intrigued by this cabbage version!